Did you think I had abandoned ship? It has been quite the month and not necessarily in a good way. I worked 24 days straight in preparation for a huge event at my day job and then a family member got very sick. In those moments nothing else really matters. Even in the midst of tough times we celebrated my nephew Luke’s 12th birthday and served up seconds of a delicious ice cream cake I made and failed to photograph, on Mother’s Day. Tonight is the first time I could put together a coherent sentence. That decadent sandwich you see was part of my research on an article on Waffle sandwiches, which have been the rage here locally. 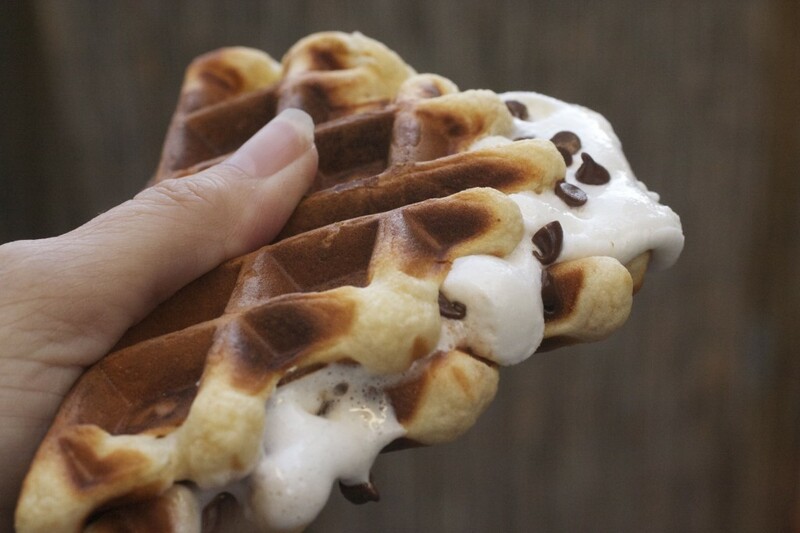 When the article comes out I’ll link to it but this one is a simple waffle, made from Bisquick and filled with marshmallows, graham cracker crumbs and milk chocolate chips. I am packing for trip to Minnesota to visit a place that inspired my childhood love of cooking…can’t wait. Almost thought it wouldn’t happen with all that has happened but Wednesday am my adventure begins. You can follow my adventure on Twitter and on Instagram look for Advinthekitchen. Follow me for updates throughout the trip. Of course, I will share here when I return. Make waffles according to directions on package. Stack them on waxed paper. When ready to serve, heat the waffle iron and place half the waffle in the iron and the other half ready to fold over. Sprinkle marshmallows, 1/4 graham cracker crumbs and 1/4 cup milk chocolate chips across. Press down the other half of the waffle and close the iron. Cook until chocolate starts to melt and marshmallow is oozing out.